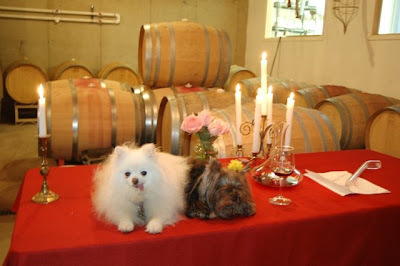 Munchkin and Pomeroy are finishing a great Columbus Day weekend of wining with all our good friends at Rappahannock Cellars. Sam gave us a great tasting in the Club Room... love those reds! 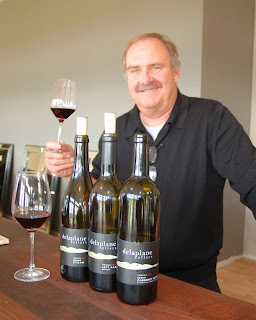 2007 Cab Franc won international award. 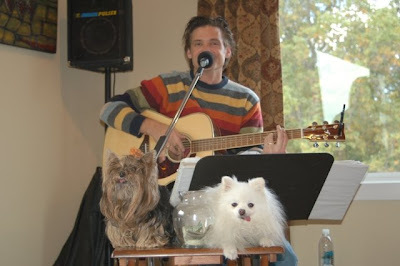 Now enjoying a concert by Robbie Limon (click on video to enjoy his mellow sounds). 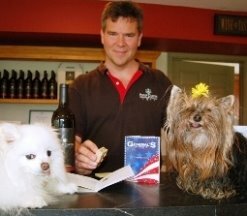 The Wine Dogs reported for duty at Gadino Cellars just as a hearty group of volunteers were finishing up the morning harvest. Pomeroy s upervised the crush as thousands of sweet purple grapes poured from basket to machine to begin their transformation into fine 2009 vintage wine. 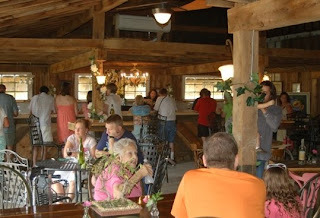 Meanwhile, Munchkin joined the gathering crowd in the colorful tasting room to catch up on the current vintages. 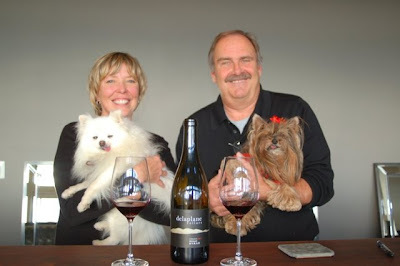 Aleta Gadino and her aide de camp, Heather, filled the Wine Dogs in on Gadino’s recent award winners. 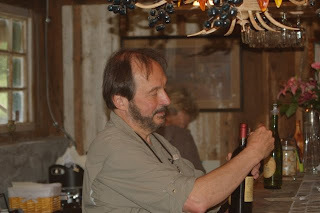 The 2007 Cabernet Franc fetched a well deserved gold. 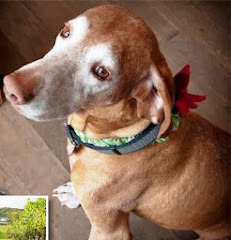 Pet named Antichi Viti Reserva because it is made from 20-year-old vines – the oldest on the property – the wine has rich flavors and the signature black pepper tones of mocha which the Wine Dogs appreciated since they are not allowed to drink coffee. 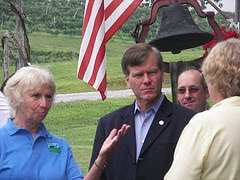 It was one of several standouts among Gadino’s 07 class, noteworthy as one of Virginia’s best ever wine-growing years. 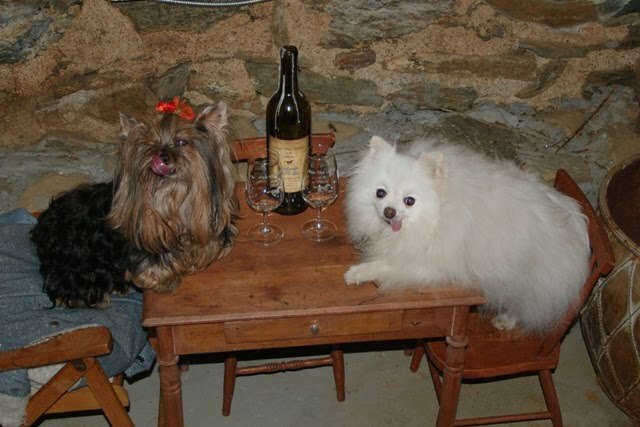 The Wine Dogs were disappointed to find the 07 Pinot Grigio had sold out during the summer, but found the 2008 to be a refreshing substitute for a patio white. 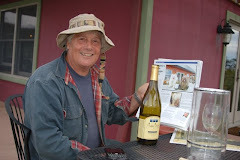 Pomeroy chose the 2006 Barrel Select Chardonney to enjoy on Gadino’s deck, where the Wine Dogs made lots of new friends and met fans who had read about them in Our Town magazine. An autumn treat was the three-squash soup, served warm with a glass of the 2007 Viognier, a crisp wine fermented in oak then barreled in stainless steel to allow the fruit to shine. Among the Wine Dogs' missions at the Gadino stop was checking on the progr ess of Petit Verdot vines they planted on Earth Day. Obviously 2009 was a very good year. 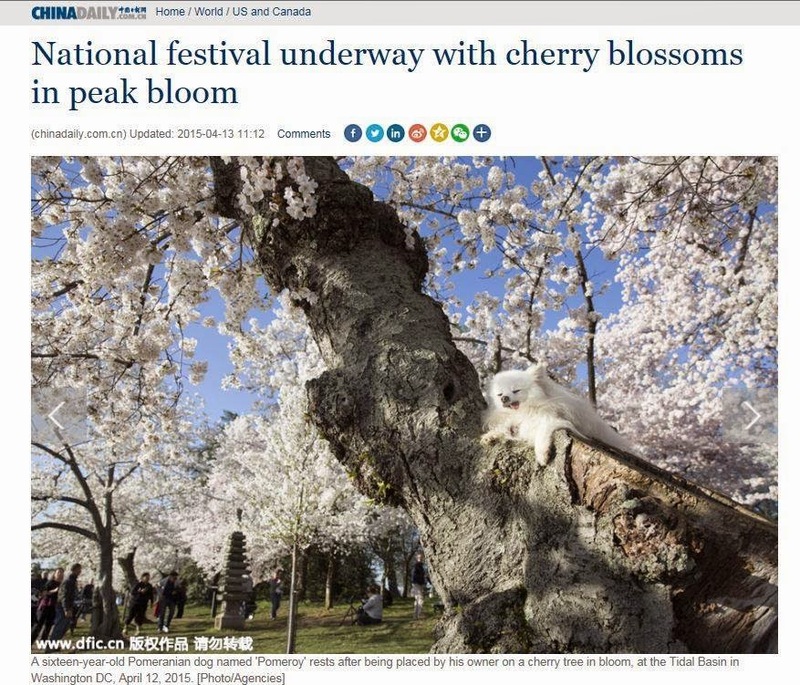 Four months ago, t he stock reached barely as high as a Yorkie's eye. Now, the vines were climbing like Jack's beanstalk and spreading across the trellises. Next year, grapes! 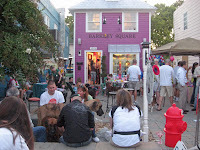 Alexandria is known for being dog-friendly, and the Del Ray neighborhood is no exception. 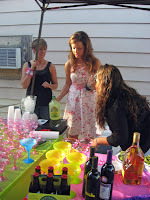 From late spring to early fall, the community celebrates the First Thursday in style with a street party along Mt. Vernon Avenue. With shops open late, humans stroll the streets and enjoy special entertainment with their children and pets. 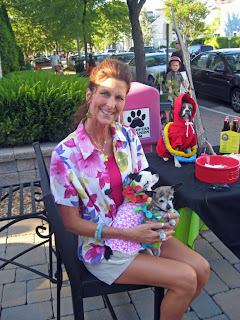 A top attraction for September's "Taste of Del Ray" was the Pawgariteville celbration hosted by one of the Wine Dogs' favorite bow-tiques, Barkley Square. 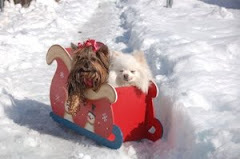 Attracted by the festive Buffet music and the Biscuit Buffet, the canine crowd poured into the courtyard. 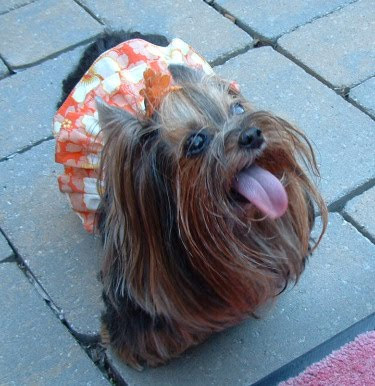 Eager to get one last taste of summer, Munchkin donned her Hawaiian print dress and joined the paw-ty, where she was warmly welcomed by owner Kristina and her little ones, Gigi and Gracie. Publicity hound that she is, Munchkin graciously consented to a couple of on-camera interviews, after which she had her photo snapped for the GW Slept Here blog (filling in for the absent Pomeroy). 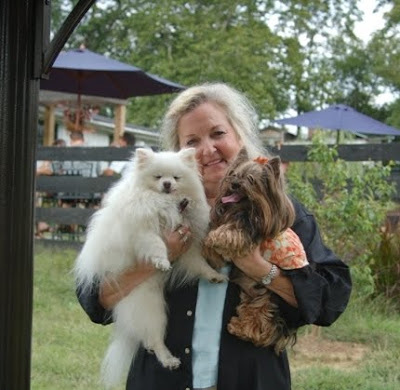 Kristina tells us that the next First Thursday (October 1) will be the big Barktoberfest. 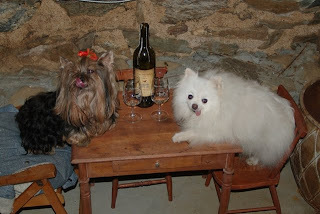 The Wine Dogs can't wait. 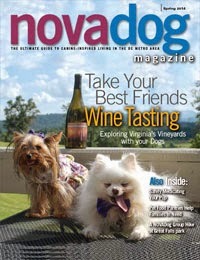 The oh-so-fabulous Vino Vixen sat down to talk industry with the Virginia Wine Dogs last month. Read on for the full interview, which appears in the September 15 edition of Our Town Magazine. 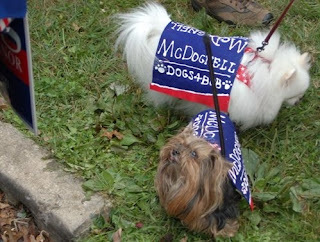 Pomeroy and Munchkin are the well-heeled dogs of refined taste and pedigree that only Old Virginia can believably breed. 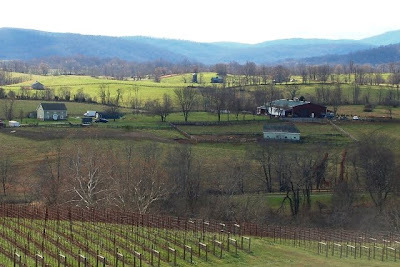 These good ‘ole Virginia dogs possess a penchant for the rolling hills Hunt Country, and a proclivity for the wines produced in the more genteel areas of our fair Commonwealth. Yes, if a pair of dogs could claim descendency from Thomas Jefferson’s four legged best friends, Pomeroy and Munchkin surely would. 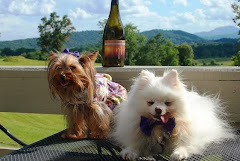 Pomeroy and Munchkin’s fondness for Virginia Wine and their naturally acute palates led to their career as Virginia’s first (and only) wine blogging dogs (vawinedogs.blogspot.com). 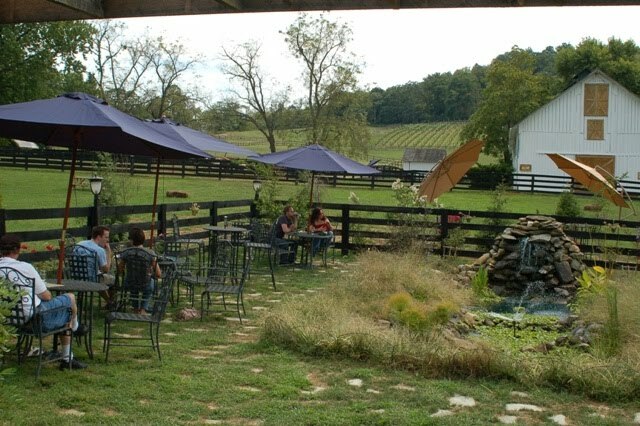 It’s an appropriate gig for these galavanting bon-vivants - allowing Pomeroy and Munchkin the luxury of lazy country drives to Virginia’s finest wineries while enjoying the fruits of their vineyards. 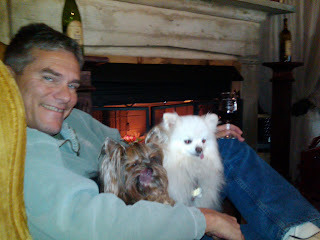 I had a chance to sit down, sip and chat with Pomeroy and Munchkin - wine critic to wine critic. VV: HOW DID YOU GET INTO WINES? I MEAN, IT'S NOT A TYPICAL LOVE FOR MOST DOGS. Munchkin: Well, my mother has a getaway house in Linden, Virginia, which is a great jumping off point to some terrific wineries. 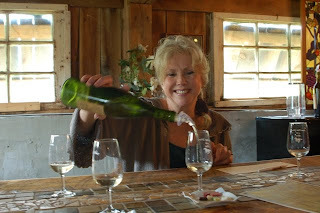 She’d take me to area wineries on the weekends and I’d scamper around the vineyards and tasting rooms. Mostly just to burn some energy and pee. 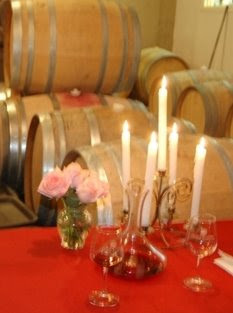 Then one day, about three years ago, I lapped up a little Cabernet Franc that spilled out of a barrel - I was hooked. I’ve never gone back to bowls of warm water since. 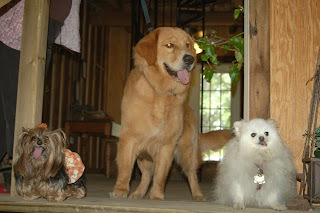 Pomeroy: My father is friends with Munchkin’s mother, so we started going along with them. 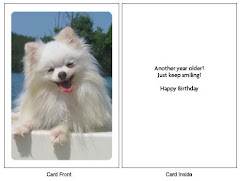 I happen to be a very good photographer, and Munchkin is a very good writer. 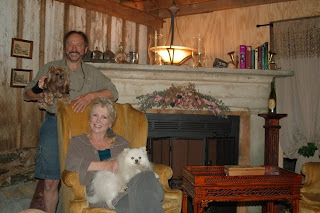 The two of us decided to put our talents together and chronicle our wine adventures on our blog. We never really wanted to do the whole fetch a frisbee, chase your tail thing. We’re a bit more evolved than that. VV: BUT, YOU ARE A DOG! WHAT DO YOU REALLY KNOW ABOUT WINE? 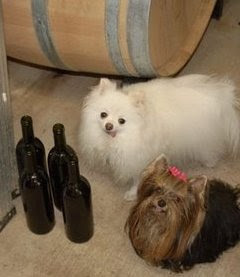 Munchkin: Look Vixen, we can explain the entire malolachtic fermentation process and describe in detail vinification steps from primary fermentation to stabilization, to bottling. We took a winemaking course at Three Fox Vineyards. And our sense of smell is about 100 times more acute than your pathetic little human nose. Pomeroy: Sorry. Munchkin gets a bit defensive when people question our wine knowledge. The fact is, we’ve visited hundreds of vineyards and wineries, sipped probably thousands of wines, and chatted with dozens of winemakers. And let’s face it. 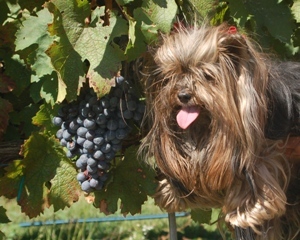 We’re furry and cute, so winemakers tend to really open up to us. Bet you can’t say that, Vino Vixen. 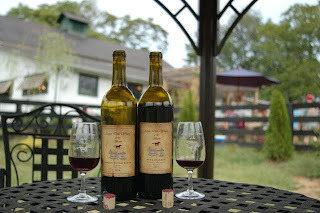 VV: DO YOU HAVE FAVORITE WINERIES? 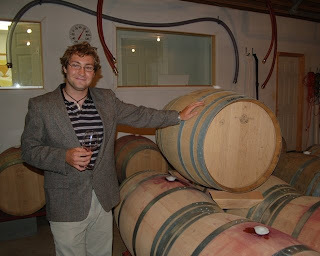 Munchkin: Pearmund Cellars (pearmundcellars.com), Barrel Oak Winery (http://www.blogger.com/www.barreloak.com/) and Rappahannock Cellars (http://www.rappahannockcellars.com/), and/or any winery where Robbie Limon (http://www.robbielimonband.com/) happens to be headlining the entertainment. VV: ANYTHING WLSE YOU WANT TO TELL THE READERS OF OUR TOWN MAGAZINE? 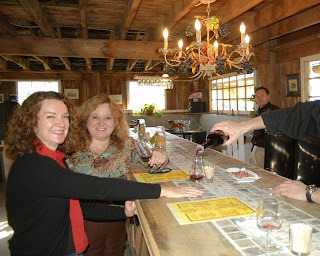 harvest will have just concluded - perfect for exploring Virginia wine country. Munchkin: With this horrendous economy, who has the means to make it out to Napa or Sonoma - much less Bordeaux or Tuscany. Your own backyard has some of the most magnificent vineyards and friendliest wineries. Take advantage of it. And Vixen - scratch my tummy and refill my wine glass. director for The Carlyle Club. 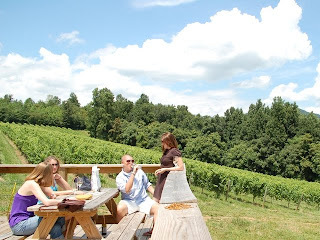 to tour the vineyards and sip the bubbly! Mari? She can be reached at VinoVixen@vinovixen.com. Munchkin and Pomeroy are back in the Outer Banks for their annual beach vacation. 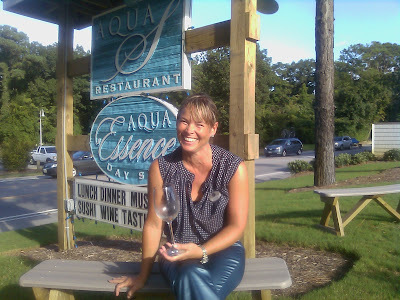 First stop as they pulled in on Saturday was Aqua S, a sassy new restaurant in Duck which opened last year. The sign out front said "Wine Tasting Saturday." 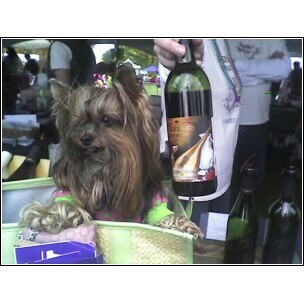 How could loyal wine doggies resist? 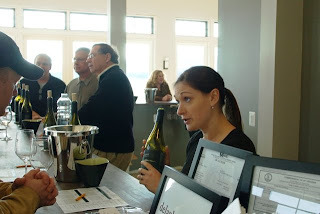 Especially when a Virginia wine -- Prince Michel's Rapidan River Riesling -- was featured. The waterfront setting proved so enticing that the Wine Dogs stayed to watch the sunset and listen to music from the deck. A return visit is certainly a must. 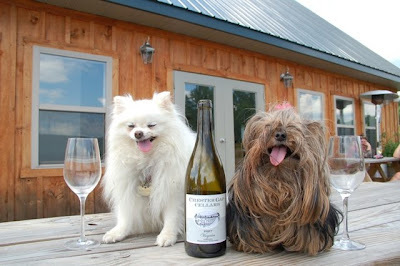 Check out the Wine Dogs' adventures last summer. And stay tuned for more Carolina Wining in the days ahead.